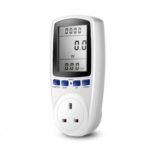 This AU Plug Power Energy Consumption Watt Meter will measure energy and cost of the household appliances. 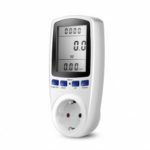 You can monitor which appliances are the killers of the high cost of energy to reduce the power bill and carbon emissions. Overload Protection, LCD will display the OVERLOAD with booming noise to warn the users. Built-in cell battery to store electricity and saving setting when power outage.